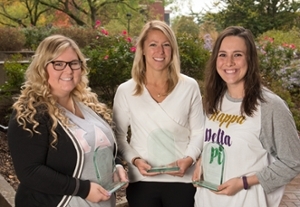 Southern Illinois University Edwardsville’s Lambda Theta Chapter of Kappa Delta Pi (KDP) International Honor Society in Education has won its fourth consecutive Achieving Chapter Excellence (ACE) Award. The SIUE student group received the honor at the ACE Awards Program Saturday, Oct. 28 during the 51st Biennial Convocation in Pittsburgh. This year, SIUE’s Lambda Theta was one of 24 ACE award winners out of the 600 KDP international chapters. “I am proud of the awards we have received, but we are committed to making ourselves better educators, instilling a love for learning and helping our community,” said Sierra Hyman, a senior elementary education major and co-president with Kalli Hentis, a senior speech-language pathologist major. Established in 1995, the ACE Awards Program recognizes Kappa Delta Pi chapters that exhibit outstanding programming in support of the Society’s mission and strategic goals. Since its inception, chapters across the country have aspired to offer creative, purposeful programming and a full slate of chapter activities with the hope of earning the coveted award. Lambda Theta’s community service is long-standing, comprehensive and extensive, according to Martin. Some of the activities the chapter is involved in at SIUE include work at the Early Childhood Center, Dance Marathon, Relay for Life, the SIUE Organization Fair and the SIUE East St. Louis Charter High School Funding Initiative. 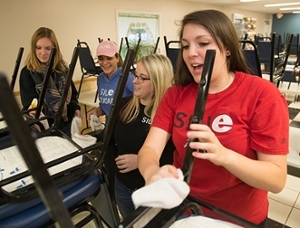 In Madison County, the SIUE Chapter is doing volunteer work for the Community Hope Center in Cottage Hills, the Edwardsville Children’s Museum, Literacy Alive, the Madison County Detention Center, the Watershed Nature Center and Angel Tree. “All of our projects are educational, child-focused and community-need based,” Martin said. Hyman said she decided to run for KDP president because of her passion for community outreach and leadership. “Educators are nurturers as well,” Martin said. KDP is an international society whose membership is 1.2 million and is limited to the top 20 percent of those entering the field of education, according to Martin. The student organization was founded in 1911 and was one of the first discipline-specific honor societies. SIUE’s Lambda Theta Chapter started in 1967. The chapter has approximately 80 members, who must maintain a grade point average minimum of 3.0. Displaying three of their four Achieving Chapter Excellence Awards are Lambda Theta Chapter of Kappa Delta Pi (KDP) International Honor Society in Education members (L-R): Sierra Hyman, KDP co-president a senior elementary education major; Barbara Martin, KDP faculty advisor; and Kalli Hentis, KDP co-president and senior majoring in speech-language pathology. SIUE’s Lambda Theta Chapter of Kappa Delta Pi is involved in countless community service hours per year. Helping at one of their regular sites, Community Hope Center in Cottage Hills, are from left to right: Jessica Wohlwend, Sommer Horton, Michelle Burrus and Claudia Puricelli, all juniors majoring in elementary education.